Flynn met with special counsel Robert Mueller's team 19 times, according to a sentencing memo. Former national security adviser Michael Flynn provided "substantial assistance" in special counsel Robert Mueller's Russia investigation, according to court papers filed Dec. 4, 2018. "The defendant provided firsthand information about the content and context of interactions between the transition team and Russian government officials," prosecutors said in a sentencing memo filed by Mueller that offered few new details of the Russia probe. 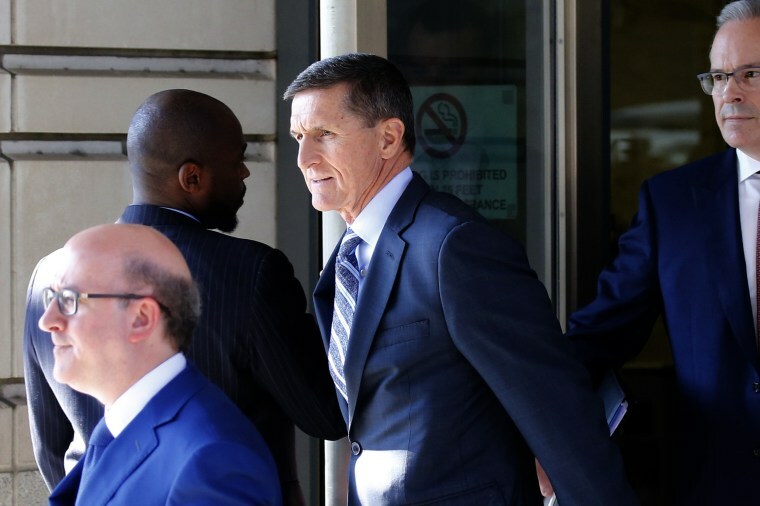 The documents alleged that Flynn failed to disclose that he assisted Turkey's efforts to remove Fethullah Gulen, a cleric whom Turkey's president accused of orchestrating a failed coup, from the United States. Reporting that Flynn met with Mueller's team 19 times, the memo says a sentence that includes no prison time is "appropriate and warranted." Flynn resigned as President Donald Trump's national security adviser 24 days into the new administration after it was revealed he discussed sanctions in a December 2016 phone call with the Russian ambassador — despite Flynn's earlier denials. Trump took 18 days to boot Flynn. Dec. 4, 2018 — Mueller says in a sentencing memo that Flynn made multiple false statements to law enforcement but has provided “substantial assistance” to the investigation, including meeting 19 times with Mueller’s team and Justice Department lawyers. Dec. 1, 2017 — Flynn pleads guilty in federal court to a charge of making false statements to the FBI about his communications with Russia. Nov. 24, 2017 — Flynn's legal team cuts ties with lawyers around Trump and his family. Nov. 22, 2017 — Bijan Kian, an Iranian-American who was a partner at the now-dissolved Flynn Intel Group, becomes a subject of Mueller's investigation for his alleged role in the failure of Flynn's former lobbying firm to disclose its work on behalf of foreign governments. Nov. 10, 2017 — Sources say federal investigators are examining whether Flynn met with senior Turkish officials just weeks before Trump's inauguration about a potential quid pro quo in which Flynn would be paid to secretly carry out directives from Ankara while in the White House. Nov. 5, 2017 — Sources say federal investigators have gathered enough evidence to bring charges in their investigation of Flynn and his son as part of the probe into Russia's intervention in the 2016 election. Oct. 27, 2017 — Former CIA Director James Woolsey is interviewed by FBI agents working for Mueller about allegations that Flynn discussed the potentially illegal removal of a Turkish cleric from the U.S.
Sept. 13, 2017 — Flynn's son Michael G. Flynn is a subject of the federal investigation into Russian meddling in the presidential election and possible collusion between Moscow and the Trump campaign. May 22, 2017 — Flynn's attorneys say that he won't give the Senate Intelligence Committee documents requested under subpoena about Russian meddling in the election and that he would invoke his Fifth Amendment right against self-incrimination. May 18, 2017 — Deputy U.S. Attorney General Rod Rosenstein appoints former FBI Director Robert Mueller as a special counsel overseeing the investigation into Russian interference in the 2016 campaign. May 11, 2017 — Flynn is subpoenaed by the Senate Intelligence Committee, which requested documents that members said were relevant to its investigation into alleged Russian meddling in the 2016 presidential election. May 9, 2017 — Trump fires FBI Director James Comey after senior Justice Department officials conclude that he mishandled the investigation of Hillary Clinton's use of a private email server while she was secretary of state. May 8, 2017 — Three former Obama administration officials tell NBC News that former President Barack Obama warned Trump against hiring Flynn as his national security adviser, saying he believed Flynn wasn't suitable for such a high-level post. April 1, 2017 — The Senate Intelligence Committee turns down the request by Flynn's attorney for a grant of immunity in exchange for his testimony. March 16, 2017 — Documents released by Democrats on the House Oversight Committee show that Flynn was paid more than $45,000, plus perks, by the state-sponsored Russian television network RT to speak at its 10th-anniversary gala in December 2015. March 9, 2017 — Nearly a month after his firing, Flynn retroactively registers with the Justice Department as a foreign agent for $530,000 worth of lobbying that might have helped the Turkish government before Election Day. Feb. 14, 2017 — White House Press Secretary Sean Spicer says Trump asked Flynn to resign because of an erosion of trust — not because any laws were broken. Feb. 13, 2017 — Trump adviser Kellyanne Conway tells NBC News that Flynn has the full confidence of the president. Moments later, Spicer says Trump is evaluating the situation. Hours after that, Flynn resigns, saying he "inadvertently briefed Vice President-elect Mike Pence and others with incomplete information regarding his phone calls with the Russian ambassador. Feb. 10, 2017 — A spokesperson tells NBC News that Flynn "can't be 100 percent sure" but doesn't remember talking about sanctions. Trump denies knowledge of the reports that Flynn and the Russian talked sanctions. "I don't know about it. I haven't seen it. What report is that?" he tells reporters. Also that day, Flynn speaks by phone to Pence, reportedly to apologize. Feb. 9, 2017 — The Washington Post reports that Flynn, according to current and former U.S. officials, did discuss sanctions with the Russian ambassador; officials confirm the content of the discussion to NBC News. This day is the first time that Pence is informed of the Justice Department's warning about Flynn's call — two weeks after Trump was told. Jan. 30, 2017 — Trump fires Yates, saying she's being axed for refusing to defend his executive order temporarily banning travel from seven Muslim-majority countries. Jan. 26, 2017 — Yates tells White House Counsel Donald McGahn what she knows about the call, according to the White House. Trump was told immediately, Spicer says, and the White House counsel launched an "exhaustive" review that included questioning of Flynn. Jan. 23, 2017 — At Spicer's first White House briefing, he says Flynn reassured him the night before that Flynn's call with Russian Ambassador Sergey Kislyak call didn't involve sanctions. The subject, Spicer says, was a plane crash over the holiday, Christmas greetings, a potential conference in Syria on ISIS and the scheduling of a call with Russian President Vladimir Putin. Jan. 20 or 21, 2017 — The FBI questions Flynn about his call to the ambassador as part of the bureau's broader investigation into Russia, according to a senior U.S. official. Jan. 20, 2017 — Trump is inaugurated. Jan. 19, 2017 — Obama administration officials — National Intelligence Director James Clapper, CIA Director John Brennan and Acting Attorney General Sally Yates — discuss the situation and want to warn the Trump team that Flynn has misled Spicer and Pence. Comey vetoes that, saying it would compromise his ongoing investigation. Jan. 15, 2017 — Vice President Mike Pence says on CBS's "Face the Nation" that sanctions weren't discussed: "It was strictly coincidental that they had a conversation. They did not discuss anything having to do with the United States' decision to expel diplomats or impose censure against Russia." Jan. 13, 2017 — Spicer says that Flynn didn't discuss sanctions with the ambassador and that the purpose of the call was to schedule a time for Trump and Putin to speak post-inauguration. Jan. 12, 2017 — Washington Post columnist David Ignatius first reports the contact between Flynn and Kislyak, raising questions about whether sanctions were discussed. Jan. 11, 2017 — Trump denies that members of his staff had contact with Russia before the election during the campaign. Sometime after Dec. 30, 2016 — The FBI reviews intercepted communications and finds the Flynn-Kislyak conversation. The matter gets folded into the FBI's probe into Russian election-related hacking and related issues. Dec. 30, 2016 — Putin says he won't retaliate for the sanctions and invites children from the U.S. Embassy to a Christmas party. Trump praises Putin in a tweet. Dec. 29, 2016 — The Obama administration unveils sanctions against Russia for election-related hacking, expelling diplomats and shutting down two compounds. The same day, Flynn speaks to Kislyak by phone. Nov. 18, 2016 — President-elect Trump names Flynn his national security adviser. June 2016 — Russian hackers are identified as the culprits behind the hacking of Democratic institutions and figures; U.S. officials will later say that Putin was involved and that the goal was to meddle with the electoral process. December 2015 — Flynn takes a paid trip to Russia and appears at a gala for RT, the state-run TV station, where he dines with Putin. I highly recommend the just out book - THE FIELD OF FIGHT - by General Michael Flynn. How to defeat radical Islam. Summer 2015 — Flynn first meets Trump, according to an interview he gave to The Washington Post.